“I was assigned to CARP by True Father, or Rev. 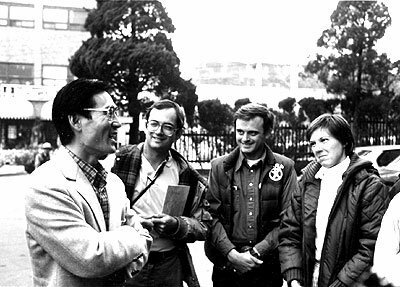 Dr. Sun Myung Moon, when he visited Oakland, California in the spring of 1979. I have heard that he would say that the spring is a good time to change your mission and it was a big change. The Oakland church was large, crowded, and nourishing. It was like a big family with huge turnouts for weekend workshops and lots of love-bombing, hugs, good food and counseling. CARP was very different then. I was assigned to a small center in LA in a ranch style house. We went to the campus each day and set up a table and had discussions with anyone who came by. I was young, shy, soft-spoken, and found it hard to express my beliefs. Boy, did that change. I worked with my first Japanese brother and sister and was schooled on how to respond when spoken to, was taught by trial and error on how to talk with Christian students, with leftist students, with agnostics, with Muslim students. I went to smaller workshops and heard the Divine Principle and was taught different ways to express my opinions, to stand up for myself, to be myself. The workshops weren’t nearly as big as Oakland’s two-day workshops, but were still very exciting and interesting. 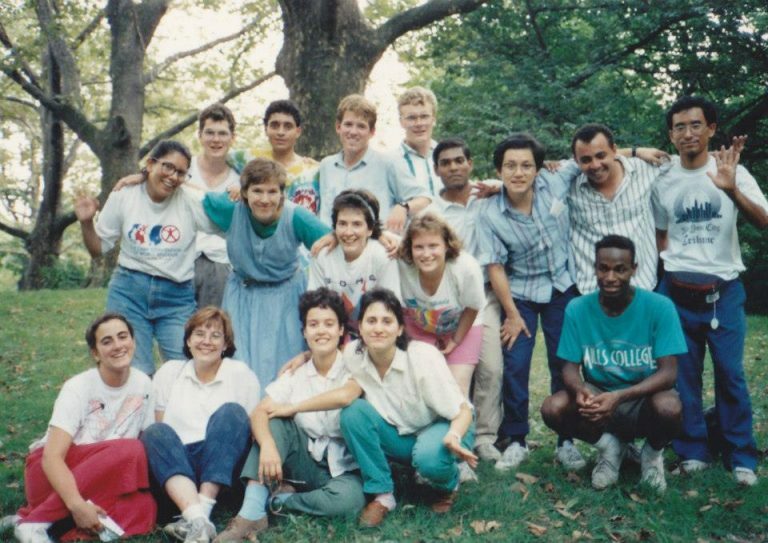 During my time in CARP, I was able to work at different California campuses – CAL Northridge, Berkeley, San Diego. It was the same situation with a book table, sometimes a white board for giving a lecture, but different students dropping by. I was able to take classes, ask questions, make friends out of enemies. I had the chance to work with Tiger Park, Hyo Jin Nim, and Dr. Seuk. I was at a book table and the same young man came by each day to give me a hard time. I just listened and would get a word or two in before he got impatient and left. Eventually he ran out of steam and vitriol and would listen to me more. About that time, El Salvador became a huge issue and we were staging a counterprotest to Communism and the Sandinistas. We got there early, front and center. Just as things started heating up we jumped up, unfurled our sign to a sudden hush and then a large outcry! We were surrounded by livid protesters with no way out. My friend (who used to give me a hard time) suddenly recognized me. Malinda, what are you doing here? He rightly asked. I could only smile sheepishly. He and some of his friends linked arms and kept us from bodily harm until the park police came and escorted us out of the fray. I also remember doing a protest at UC Berkeley with Janne Sawada’s parents, the Reids, who had come all the way from New Zealand to visit. They insisted on standing arm and arm with us on the steps and getting spat on right alongside us. I got my first death threat there, but the fierce love and solidarity from her parents carried me through. How precious to be understood and supported in the midst of a protest like that. I was able to move from membership to assistant leader or mother figure as they were called at that time. Christine Froehlich, Janne Sawada, Jacinta Krefft, Carole Durnan Silva, Pat Detlefson were and still are my mother figures, sisters, mentors and friends. In 1982, I was able to be blessed to my recently ascended husband, Steven Vogel, and then joined him in New York to start our family. We have been blessed with a son, Nicholas, who is my company, support and source of pride. Nicholas was born while I was an IW, or counselor for CARP MFT, and then editor for the World Student Times, and then Frontline, CARP’s magazine at the time. This was one of my favorite missions. I learned editing, graphic arts, layout and loved it. We lived in the New Yorker Hotel and I got to be part of the Headquarters staff working directly with Dr. Seuk. What a long way for a timid girl from Minnesota. Just after Nicholas was born, the Russian Providence began. 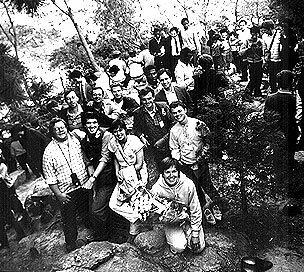 I was unable to travel there and participate, but when Steve moved us back to his hometown, Nicholas and I flew to San Francisco for a last hurrah – 40 days of witnessing with Russian students for me and 40 days in a CARP daycare for him. We cried in our separate beds many nights, but found God in many ways during our 40 days. Nicholas began to walk and I began to find my strength separate from him and my husband. After we moved to my husband’s hometown, I continued to stay in touch with my CARP sisters, friends, leaders and mentors. Since moving to Louisville, I have found myself less nervous to stand up in front of groups of people. I led my son’s Sunday School class where I was the “fun” teacher because shouldn’t those students be allowed to speak up, too? For someone who would get panic attacks at being asked to stand up and speak to a room of people, I faced crowds of screaming students at different campuses, read Father’s words at several WFWP events in Kentucky, and even at a community meeting in Seoul, Korea. I was also able to lead Head Start parent meetings and to teach in a Head Start classroom and take turns at giving Sunday Service. I was able to use my skills at work, in the community and in my own church. My CARP training gave me the courage and patience to sit through my husband’s chemo, radiation, surgery and therapy drawing on years of faith, the love and example of our True Parents and an irresistible sense of duty. God, Steve and Nicholas needed me – weak or strong, ready or not, I was it. My training in CARP has been an amazing way to find myself, to find my strength, to test my faith and my leadership skills, to overcome my fear of public speaking, to shore me up through my husband’s battle with cancer, ascension and this path of grief.